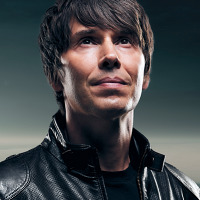 Brian Cox is a renowned physicist, member of the Royal Society University Research Fellow and familiar TV presenter. He has worked on the ATLAS experiment at CERN in Geneva and specializes in particle physics. He and Robin Ince founded the show Uncaged Monkeys, a mixture of science, reasoning and humour. In a previous incarnation he was a member of the 90's chart pop act D:Ream and the rock band Dare.